By the Day of Russia it prepared its present for the little Russians. Together with the party of “United Russia" and Orenburg administration the circus the directorate of the circus gave a charity performance which has become a good and kind tradition for the past few years. 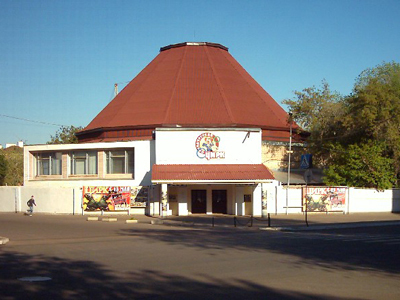 The charity performance by the Day of Russia took place at the square in front of Orenburg circus. Every year there are three to four free performances for inmates of a Children’s Home. Evgeny Teretschenkov, director of Orenburg circus, has a rather rich experience in the organization of such events. For already 10 years he has worked in the project of the party of "United Russia" which is called "The Family and Children in the risk group". More than one thousand and a half people visit charity performances every year. Children come here to see a wonderful performance and become absorbed in a magical world of circus. Children watch the programme of Maritza Zapashnaya, hereditary animal trainer, with wide-open eyes: the artist’s profession fascinates and intrigues a lot of people. Charity performances are a real holiday for the children because they not only watch the performance but also get presents from the organizers of the event. The children-orphans’ lots are not indifferent to Orenburg circus. The reconstruction which started in the company "Rosgostsirk" gives a chance to pay more attention towards the children who are in Children’s Homes and social orphanages. - In the near future the reconstruction of the old circus and the construction of a new one will start. The local administration has allotted the land to us for the construction, - says Evgeny Teretschenkov, director of Orenburg circus. - On the basis of the old circus we are going to open a circus college, where there’re going to be, beside the common groups, two groups for the inmates of Children’s Homes. Teachers are going to be engaged from the local college of culture, and, certainly, we would like to see artists form the Russian state circus company as our teachers, too. To realize this project we are going to build a hotel on the allotted territory – so that artists who are going to be invited by us can live in comfort and work in the workshops of the college imparting their experience to the youth. Certainly, not everybody who comes to the circus college will become artists and real masters afterwards, but the principal aim of the circus college in Orenburg is to give children a chance to be taught an interesting creative profession and show themselves. Judging from the statistics, children devoid of the parents’ care not rarely go to streets after the Children’s Homes. Such an extremal and dynamic art as the circus can distract teenagers from the street making them interested in the culture and creative activities.